C&S Outdoors owns 3 billboards in Alabama. C&S saved $30,000 on the upfront cost of a digital sign by using an innovative partnership between Watchfire and Blip. Insider talked with Grant Cox, manager of C&S Outdoors about the plan. Grant tell us a little bit about your digital sign project. 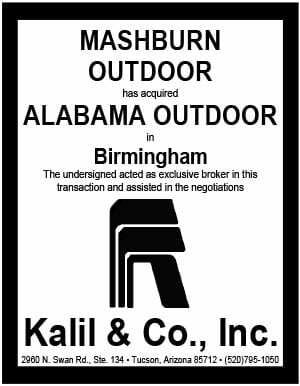 C&S Outdoors is a young, independent outdoor company with three billboards in the Birmingham, Ala. market. The company is committed to serving Birmingham advertisers with affordable solutions in the area’s best locations. 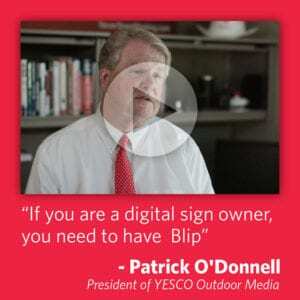 We installed our first digital billboard this year on a prime location near the intersection of Interstates 20 and 59 in the Woodlawn area of Birmingham near Shuttlesworth International Airport. The billboard is 12’ x 24’ and was manufactured by Watchfire Signs. Advertisers on the board include local companies such as breweries, landscaping services, contractors and home improvement services. How does the Watchfire Advertising Plan work? The Watchfire Advertising Plan works by pre-purchasing advertising space, which immediately reduces the upfront price of the digital display. The price reduction has ranged from a few thousand dollars for some customers up to half the price of a 14’ x 48.’ The value is unique for every location and is based on traffic count and duration. C&S saved about $30,000 on the upfront cost of our new billboard by devoting one advertising slot to the Advertising Plan. Does the Advertising Plan compete with you for advertising? Not at all. The Advertising Plan delivers pre-sold advertising that dramatically reduces the upfront price of any new Watchfire display. It’s pre-purchased advertising for an upfront incentive on the cost of the board. All I have to do is approve the ads they send me, which takes just a few minutes a day to approve five to 10 ads. What’s been your opinion on the program? We like the Advertising Plan so much that we are planning to install a second digital billboard this year and we will again devote one spot to the program. The Advertising Plan is a great way to secure the highest quality digital billboard at the most affordable cost.